For a land-locked country surrounded by much larger countries, Laos has its own flavors. Bida Manda serves authentic Laotian food and is one of few Laotian restaurants in the U.S. Bida Manda is the Sanskrit term for father and mother; and in the spirit of family, siblings Vansana and Vanvisa Nolintha created this restaurant to honor their heritage and culture. The food takes you to another place, but the atmosphere is created from locally sourced items, such as the wooden sticks from Western North Carolina that decorates the walls. Laotian food uses some of the same ingredients as the more familiar Thai and Vietnamese cuisines, but with more subtle flavors. Laotian food also lends itself to its French history with items such as the baguette used for sandwiches in Laos. For a more in-depth analysis of the differences between Laotian and Thai food, head over to Victoria’s Food Secrets. I ordered the green papaya salad, one of the restaurant’s specialities. It comes with your choice of meat, fish or vegetables. 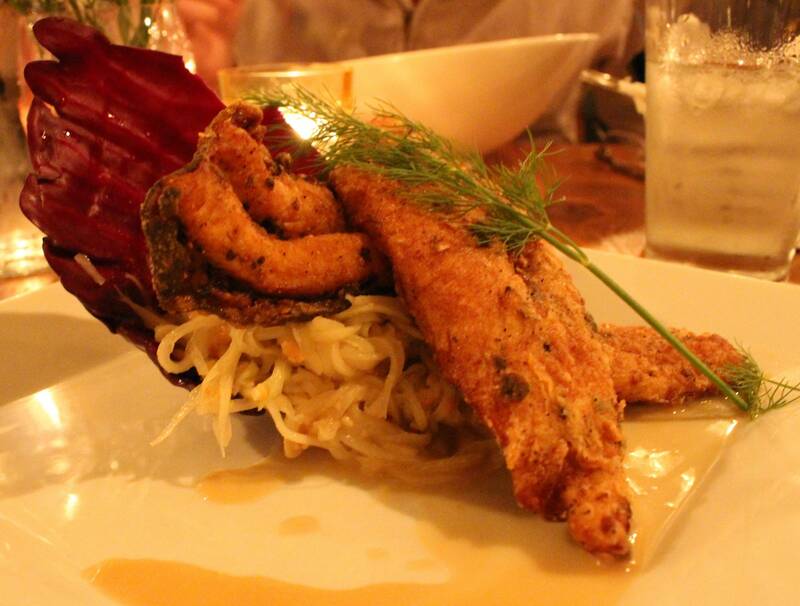 I got fresh caught N.C. flounder, which was seasoned with salt, pepper and aromatic herbs. The salad tasted fresh and had some of the same ingredients as pad thai sauce, but it was lighter and the taste was more subtle. “Differences are often subtle to the non-native palate, but generally speaking, Laotian flavors tend to be a little earthier, a little less bright than those of their neighbors,” writes Greg Fox for News & Observer. 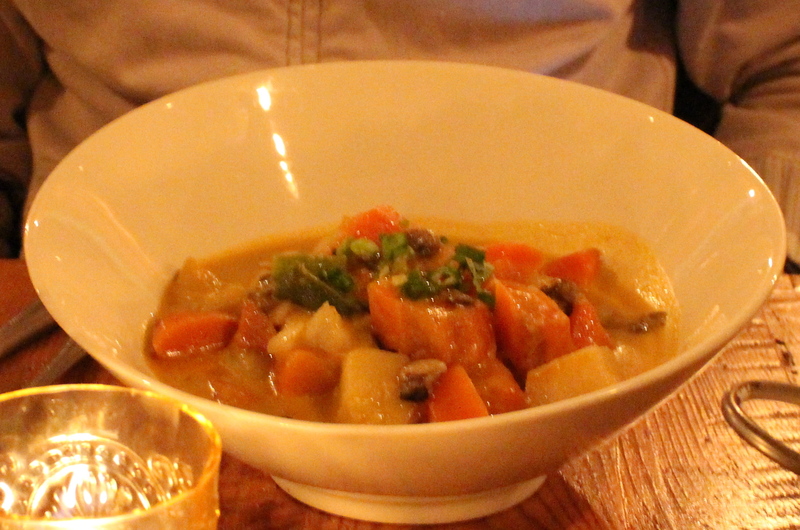 Javier ordered the pumpkin curry, which had a variety of root vegetables. It is served with rice, which helps with the spiciness. However, we both liked my dish better. I recommend the green papaya salad for your first time at Bida Manda. Mix jasmine rice, curry, salt, and sugar in a small bowl. Mold the mixture into thick patties. Fry the patties until golden brown. In another bowl, break the patties into small pieces, and add cilantro, mint, green onion, fried garlic, peanuts, and lime juice. Toss until fully mixed. Wrap the mixture with fresh lettuce leaves. Firmly rub the the ribs with soy sauce, black soy sauce, ginger, and brown sugar, and let the ribs marinate overnight. At medium heat, braise the ribs for three hours. Once done, strain the sauce from the ribs, add shelled, whole hard boiled eggs to the sauce, and reduce the sauce in a pan over low heat until it thickens. Add the ribs back to the sauce, remove and slice eggs, and serve together. I am a North Carolina native and I love trying new restaurants. I have a special interest in Middle Eastern food and vegetarian options. Love your work…very visual! Dropped you an email today but would love to connect and pick your brain about the Triangle food scene!